Pears picked from the ground around the tree. The most important part of wine is the fruit, but that doesn't mean the fruit has to be pretty. Traditionally fruit that wasn't good enough for eating was used to make wine. Though food-quality pears probably do make the best wine, pears that has fallen from the tree or are ugly or a little old will also make excellent wine. This is not a recipe for wine making experts, it is a guide for regular people who have an abundance of pears that they cannot sell and are not going to eat. This is a simple and basic way to make wine, and it works very well. 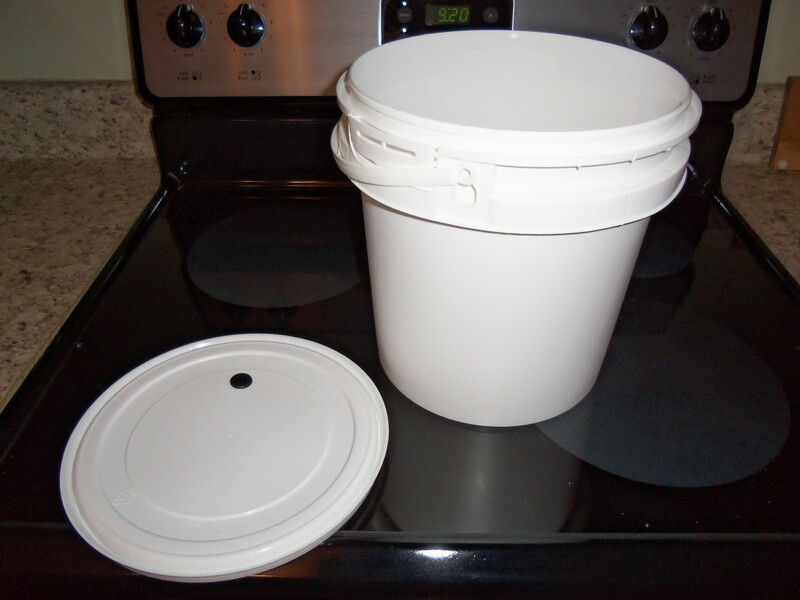 A brewing bucket with a tight-fitting lid and a hole for an airlock. You need to find a suitable container. For this recipe and in these photos, I'm using a two-gallon bucket with a tight-fitting lid and a hole for a airlock that I bought at a wine store for $7. Glass or plastic jars, bottles, or jugs will work just as well. Whatever you use, make sure it's clean. If you don't have an airlock, you can either poke small holes in a balloon with a pin and stretch it over the mouth of the bottle or, if your container has a screw-on lid place wax paper over the top and then twist the cap a half turn or so, so the container won't build pressure but will keep anything from getting in. The first step is to cut up the pears. First you will need to cut up the pears. Try to cut out any large parts that are brown and mushy. If you have a large-mouthed container (optimal), then a rough cut will do fine. If you have a container with a small mouth then you will need to cut the fruit small enough to easily fit inside. Remember that you will also need to get them out when you are done. Place the chopped fruit in the clean container. Put the sugar over the top. You can make the wine without sugar, but it will have a very low alcohol content. At this point I also add a dozen or two raisins as they contain nutrients that the yeast will feed on, but this is not necessary. Next, pour the boiling water over the fruit and sugar and fill almost to the top, leaving a little room for foam during fermentation. Using boiling water will kill any organisms in the water, container, and pears. Stir the mixture until the sugar is dissolved. If you have a small-mouthed bottle, put the lid on tight. Hold it with a towel and shake it to mix. Be sure to loosen the top as soon as you are done so that the bottle will not implode. My plastic bucket held up fine with the boiling water, but I would not recommend flimsy plastic (no milk jugs) for the primary fermenter (the first container you use). This recipe does not need to be exact. Just fill a container about half-way, or a little less, with chopped fruit, add about a pound of sugar per gallon of container size, and fill almost to the top with boiling water. For those without scales, one pound of sugar is two cups. The bucket with the lid and airlock in place. 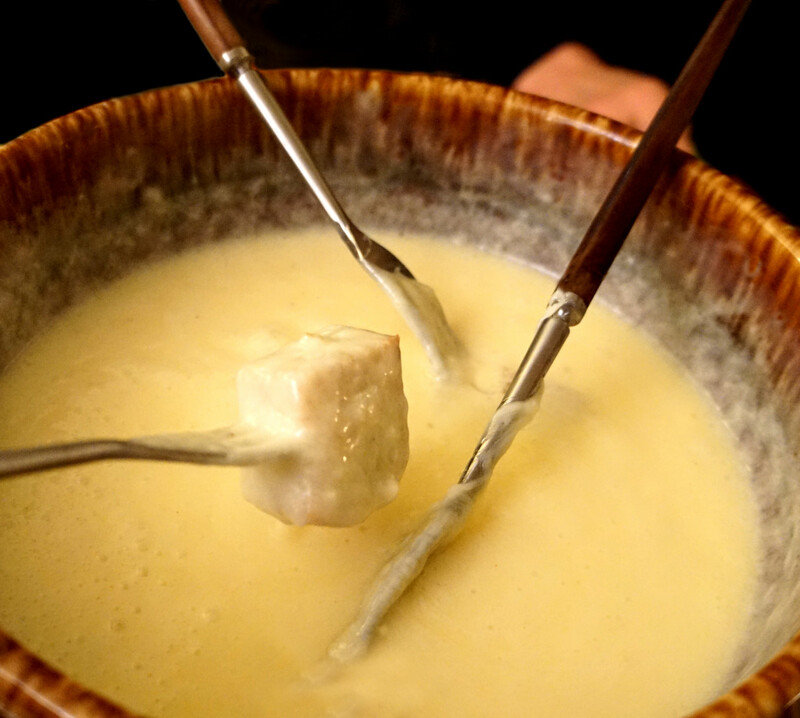 After adding the water, cover the mixture, which is called the "must", and allow it to cool. I suggest leaving it overnight. When it is cool add the yeast. Most supermarkets carry bread yeast in the baking section. 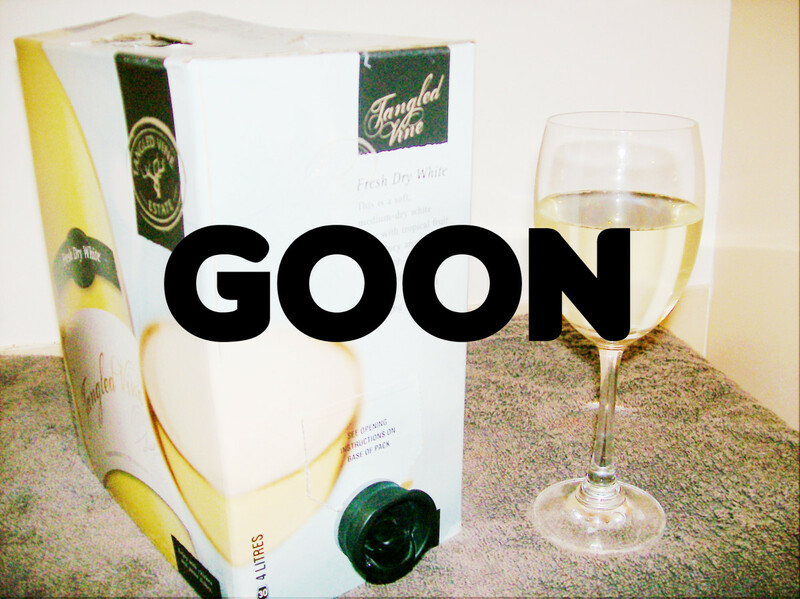 You can buy it in packets or, if you plan to make more wine in the near future, buy a 4 oz. jar. Wine yeast can be purchased online or at wine stores and will make better tasting wine but bread yeast is just fine. After adding the yeast, gently stir or shake the must then put on the lid and/or airlock/balloon, which allow gas to escape but will keep organisms out. You should be able to see bubbles rising to the top within a day of adding the yeast. This means it is fermenting. Put the wine in a place that is room temperature or slightly warmer and let it work for a few weeks. After 3-6 weeks you will want to put the wine in a new bottle, separating the liquid from the solid. The best way to do this is to siphon it using a small tube like aquarium air line, which is available most anywhere fish are sold. You could also strain it, first through a screen then through a cloth, just remember that too much turbulence will mix air with the wine and hurt the flavor. Odds are the wine may not smell all that great when you open it, but if it wine smells strongly of vinegar then it has spoiled and will need to be dumped. A little funkiness is nothing to worry about though. At this point you can either drink the wine or, if you are sure it is through working, bottle it and let it age for a year or so to mellow the flavor. This recipe is not set in stone, feel free change the ratios and see what different results you can get! Also, if you use this recipe please come back and tell me how it went. Is all the ingredients organic? I used dates instead of raisins and made two buckets. One using apples and the other pears. It’s been 5 weeks and I did notice some starch settlement. But with some fine filtering should turn out just fine. The flavour is very nice. Can I make apple wine with the same method, fresh fruit cut=up? I think I screwed up. 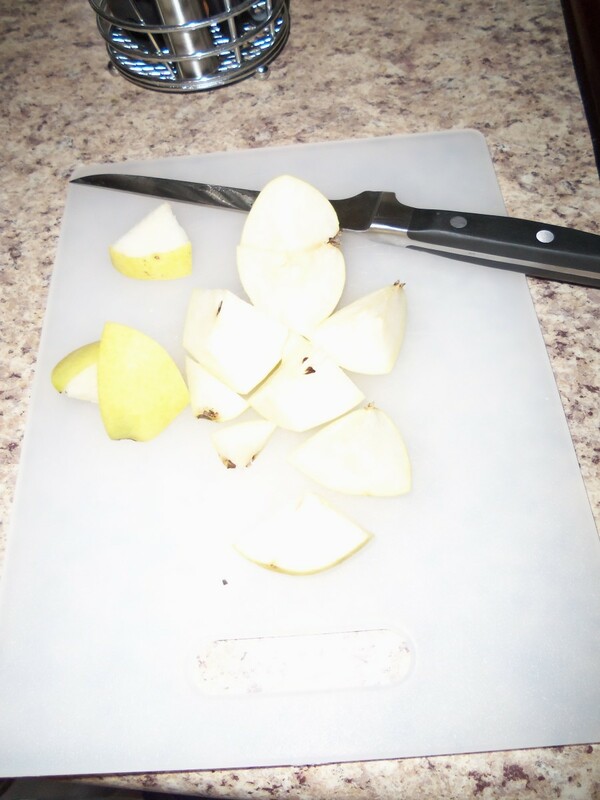 I cut up all the pears, added the boiling water etc. and then it's been a couple of days before I could get any yeast to add. The mixture is kinda slimey. Should I start over with apples or is this batch retrievable? Help! We used your recipe last yards when we had an abundance of Kiefer pears. After about 5 weeks it was siphoned into 5 liter bottles and we let it clarify for another 3 weeks and then we bottled. The flavor improved in 6 months an d now, a year later,it is amazing. I have been brewing since 1969, mead mostly, and the raisins not only aid the fermentation but they also keep the yeast foam from boiling over out of the fermentation container. I didn't have raisins on one batch, mixed it all up and realized I needed raisins, so I went to the store and got a box, came home and added a handful to the bottle and the thing turned into a foamy volcano! I lost about 1/2 gallon out of 5 from foam going all over the kitchen floor. Next time add the raisins before the yeast. can i use pectic enzyme? You say to add the yeast and then put the lid on right away. From what i`ve been reading elsewhere they say to wait a couple of days and let the yeast breath first. Any thoughts on this? 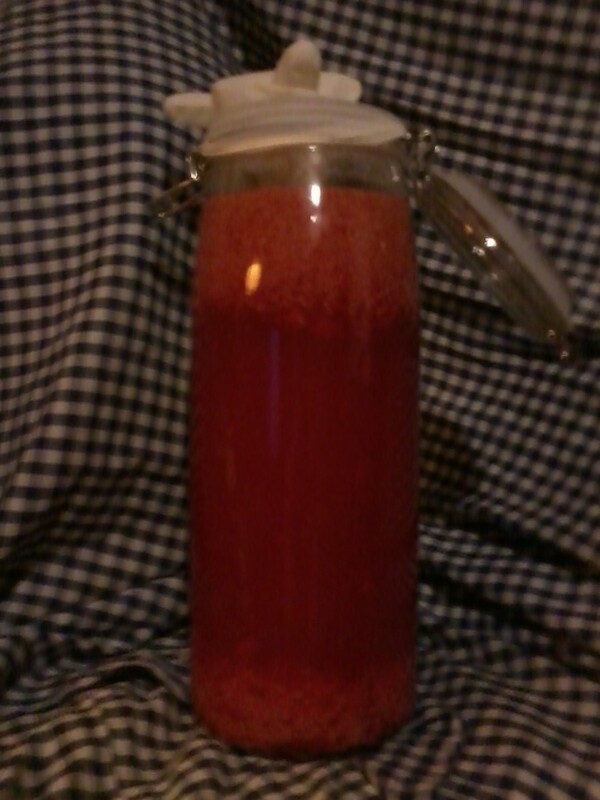 I got NO bubbles coming out of my airlock so i have de-lidded my mix. 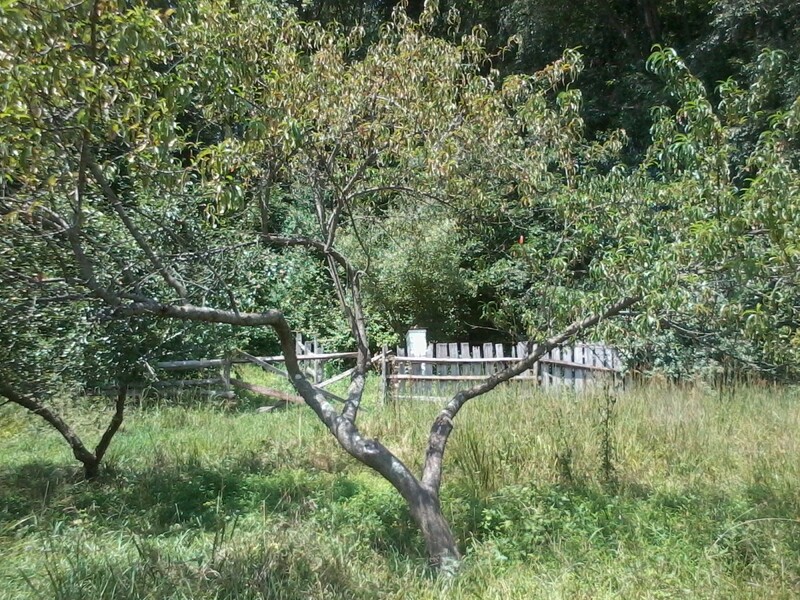 I have a pear tree that produces small hard pears that most people find too hard. I have been making it into wine for three years now starting with this basic recipe, my small tree produces enough for 3-4 batches of 2 gallon a year. I have found adding the juice and peel of a large, unwaxed lemon to each batch reduces the unpleasant odour of camphor that can occur. I use a high alcohol resistant yeast which prevents the wine turning out sweet as it gobbles all the sugar. I find raisins can often make the wine cloudy, a jar of cheap honey and a spoonful of yeast nutrient really seems to perk up the brew. But Sultanas have the effect of turning the wine a beautiful golden colour, just be sure to wash thoroughly as they tend to be waxed. Ive been coached by older farmers n their wives on traditional ways to make wine. Campden pills are sulfite so if gout or arthritis runs in family.. its proven to accelerate it. I use crockpot(no metal pots or spoons) heat wine b4 bottling to 140deg(i use candy thermometer), then turn off n let cool. Leaving cover on and a towel w rubber band around. This kills the yeast and any bacteria. Ive had good luck doin this. Got 5 crockpots now. Yardsales etc. Alchohol stays in wine. So is this recipe effected negatively by using campden tablets. Added with the boiling water, 24 hours before the yeast is added, and just as it is being bottled? Very new to this and curious. Mine is very sweet is there anything I can do to unsweeten it? I am a first-timer. I have always wanted to make wine, but when I've read the literature and recipes, they've scared me away--until your hub! You made it sound so simple that I grabbed what I had (including the pears from my father's tree), and I started my first batch last night. My father had always wanted people to enjoy his pears and would be so disappointed when they fell to the ground and rotted. He passed away from Alzheimer's in July, so "I'm making this for you, Daddy." This is a great recipe. Made it several times now and always with great results. This is an excellent beginners recipe if you are new to the craft as well as a great recipe for even advanced. Only thing I recommend is a wine making yeast. I've run it both ways and it works great either way but with bread yeast it has a definate bread flavor. It is not an overpowering flavor but you know it's there. Either way. Thanks for sharing it. you say add 1 packet or 1 tsp bread yeast, but 1 packet of yeast = 2.25 teaspoons. Am I missing something here? Or how much yeast should I add? Hi, so I doing this recipe. Just finished adding the boiling water and gonna let it sit til the am. I changed it a bit, added purple plums, green grapes, and dark cherries to the mix (while still keeping the 3/4 gal of fruit). My question is: would it be best to put in a sunny room (I'm using a clear 3gal wine jug. Sterile) or in a dark place lime a closet?) if I dont happen to hear from you by the time I add the yeast, ill just put it in a darker but lit room. I am trying this for the very first time and I am very excite. Thanks for your information! The only thing I didn't see is am I supposed to stir this once in a while or just let it sit? Hope you see this soon I see this hub is old...Thanks again! The pear wine turned out great! I added a couple of shakes of lemon juice (the bottled kind) to the must. I stirred the top of the must 2x a day and used a metal strainer to grab the raisins and pear pieces after 7 days. I added 5 Tablespoons of yeast and 5 lbs. Of sugar to a 5 gallon food grade bucket. I just set the lid on the bucket without an airlock. After 3 1/2 weeks I strained the wine through muslin cloth and put it in a carboy with an airlock. I'm paranoid that the containers weren't clean enough. I was fearful of the chemicals and didn't use them. The wine was very good before I put it in the carboy. I used a small saucepan as a ladle because I've never used a siphon before and didn't want any water to get into the wine. It was all very fun and I will definitely practice using the siphon before I rack it up. Thank you for your post. I have a lot of apples, can I mix pears an apples together, using recipe as is? How about rhubarb an pear. I don't think i could leave it for a year. I'm not sure that the flavour would improve enough to make the self denial worthwhile. hey, if i want to make my pear wine a sparking wine, can i just add gingerale or something like that? and when would i do that??? I did some research online and to ripen pears pick them at their peak size put them all or as many as you can bag and put them into the fridge for 24 to 36 hours then take them out and in about 24 to 36 hours they will begin ripening. It worked last year with my 100 lb. batch that I used last year. Otherwise pears ripen from the inside out and there is a very small window you could actually pick them ripe....Also last year I juiced all 100 lbs of my pears with a jack lalane juicer and then did this process similar to Rick's but added granulated ginger and a few peppercorns as well as the raisons. It was a complete hit and the best xmas presents I could have given to friends, and family. Just waiting for my pears on my tree to be ripe enough, ordered my kit today, so excited to make this wine! I have an old wine making book that says if you don't use a use a bubbler or something to keep flies out. These flies carry a bacteria that can turn wine to vinegar. It also says these flies are attracted to wine vessels while making whineand will magically appear when wine is brewing it can also be transmitted through air or water if your bubbler don't have campden or another Chen to kill the bacteria before it passes the water in the bubbler . You can also use a hose in a bottle full of water with the chemical to stop the pathogen. It is also airborne. So if the air in the tube going to your brew gets contaminated the pathogen will grow ,contaminate the wine ,turn it to vinegar witch; will go good for cooking but not for drinking. I like your recipe its quick and easier than the one in the book. And I think the lime has an acid that makes the yeast react better ;like a toner. You can stick cotten in the tube where the air escapes and it will keep the flies out and some air born pathogens. And that white film I think its left over firment . People make wine in shampoo bottles in jail . How hard can it be? Tammy, the pears should be just ripe, you can use any variety (experimentation is recommended) , and if anyone has tried it with Asian pears I would also like to hear about the results. How ripe should the pears be; dead ripe right before going bad or just ripe? Does the variety of pear matter? Has any one tried this with asian pears? 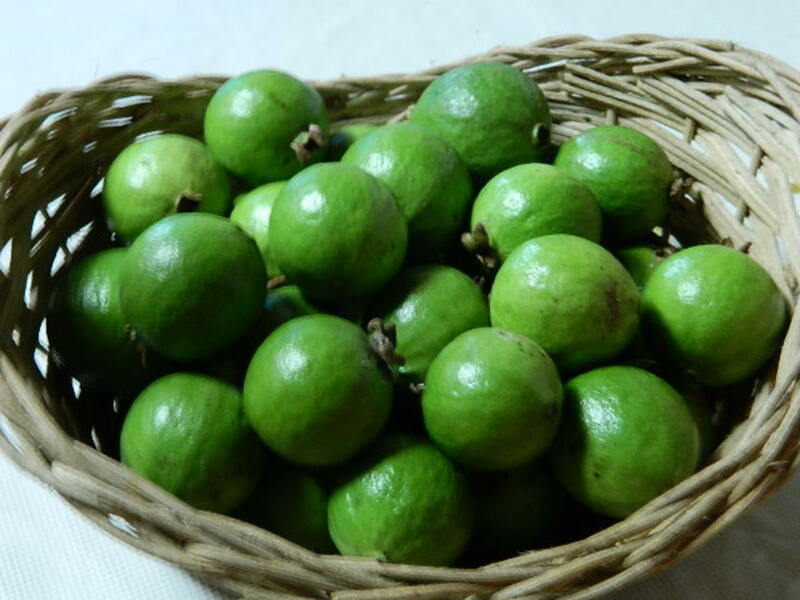 There is a variety of asian pear they call the rum pear, yes it tastes like rum, just wondered if that sounded good. Sorry, I've been away for a while. Cory, yes you can use it for apple wine. Delilah, this is way too late but if it isn't fermenting within three days add more yeast. Mary, I wouldn't set it in front of the heater. Room temp will work, just a little over room temp is great, but in front of the heater doesn't sound like a good idea. Since it isn't bubbling I would say that the fermentation is mostly over. Wait a few weeks and bottle it or go ahead and move it to a secondary fermenter/clarifier (this is the same thing it's in now, the idea is to get it off the sediment and let it finish working and settle some more.) I'm glad to hear all of the successful wine comments! Keep them coming. Hi Rick, thanks for the recipe. My first batch is two weeks in and has stopped bubbling? I kept my apt. pretty chilly, between 60-65F. But it was bubbling strong just a few days ago and my house has stayed the same temp? I'm going to place my jar in front of the heater. Any further suggestions? The pear wine turned out great. got 22 1/2 bottles. I added the yeast to my pears after waiting overnight for the solution to cool it has been 24 hours but I do not see any bubbles in the air lock yet. When should I see bubbles and what should I do if I don't see any? Could I use this recipe for apple wine? Glad you were happy with the ABV Roger. If anyone figures out how to make a sweet version of this please let me know. I let ferment for three and a half weeks. Racked and let sit for three days then bottled. I plan to start a second batch this weekend. I have a snap down lid without hole how can i make that work. Sorry, again, for the delay. Brandon, this recipe uses one teaspoon of yeast. Sarah, if you put the yeast in with the boiling water the yeast will more than likely have been killed. Your comment is from eight days ago, so if your batch has not began fermenting by now then the yeast is definitely dead. But there's still hope! Just pop off your airlock, add the yeast on top, then quickly replace the airlock. Odds are your wine will be fine. If you want to really be sure you can dump everything in a pot and bring it to a simmer then return it to the fermenter after it has cooled a little. Add the airlock, then once it is at room temperature remove the airlock , add the yeast and replace the airlock. Michelle, I hope it's delicious, and congratulations on your first batch! Brusckie, I don't really have a set method. I'm a tinkerer, a procrastinator, and pretty forgetful. I like trying different times to see if I can make a better wine, and sometimes I just plain forget about it. That's how I discovered that leaving wine in it's primary fermenter for a few months isn't necessarily bad, as many brewers would lead you to believe. Then again, I can't say for sure if it's better, either. I'm kind of bad at the scientific method (i change two or three things per batch, so I can only guess at which elements had which effects on my flavor). All I can tell you is that my current batch (wild blackberry) was in the primary fermenter for five weeks and will probably age in the secondary for about six months. After that I will bottle and drink some of it, keeping one bottle in my "cellar" for my collection. We are wondering about your timing. We usually put primary in a large crock for 3 days, then three weeks in a carboy secondary, then rack and leave for three months. What are you doing? Thanks. Can't wait to try this recipe! Our pears are ripe and ready! we drank our homemade white grape/peach wine as we made this pear wine. the pear is our second winemaking and if it comes out as good as the grape/peach....we're good to go! We'll add the yeast in the morning and then w a i t.
We're going to be making this wine tonight! we'll let ya know how it goes. I put everything including the yeast in all at once. Will it still ferment? Glad you like it Brian. It's bottom fermented, you'll need to transfer to a second bucket as the sediment will probably be a little too deep to use the spigot. Hope it turns out well. Hey, great recipe. I have pear trees and far too many. One question...is this a top or bottom fermentation? Meaning could I ferment with a bucket that has a spigot on the bottom and then use line to feed bottles or a second bucket like when making ale or lager? Thanks so much, looking forward to trying this in a few days, just trying to assemble the hardware now...Cheers. Hey Magnolia Mama. Sorry it took a few days to reply. To start I should state that I myself am not an expert, just an enthusiast. I think I can help with your questions, though. First, you should not check the wine while it's fermenting. Every time you open the container you risk exposing the wine to undesirable organisms that can cause off tastes or even spoil the wine. Next you asked if longer is better. Your wine should spend at least three weeks undisturbed in it's primary fermenter (initial bucket). After that it's up to you. The experts seem to prefer "racking" the wine to a new container at this point to get the wine off of the fruit and sediment, however I have made some wonderful batches of wine by leaving it in it's primary fermenter for much longer than recommended (sometimes weeks longer, sometimes months..) I'ts really up to you. I'm guessing you will probably be eager to try your experiment, so feel free to siphon it to a new, sterile, secondary container after three weeks. This will give you an opportunity to taste it. As far as not making it too dry goes...now you are getting out of my range. Sweetening wine can restart fermentation, which can cause your gift bottles to burst. There are several ways to do this successfully, and if you are interested there are many great wine making forums online. I'ts a little too much for me to tackle here. Sorry. Campden tablets are great to stabilize your wine but not necessary. I would siphon my wine to a clean fermenter with an airlock, let it work for a while longer (as long as you can stand) then add one crushed campden tablet per gallon of wine a day before bottling. Campden tablets have many uses, again I will refer you to other resources online. I hope my (limited) answers have helped you, and I hope your experiment is a success! William, I had a wine with a film like that once. I don't know what it is. It smelled and tasted fine, I just scooped the film off and wiped away the residue on the bottle with a napkin. I drank the wine pretty soon after that, so I don't know if it would have made it go bad with time. You will need some kind of tube or hose to siphon out the wine to taste. Pouring it will stir up the sediment and the white film (if you aren't able to clean it out). If it were mine I think I would go ahead and bottle or drink it if it tastes ok. I have some wine made from wind fall pears. I racked the wine into a glass demijohn. I now have a white film on top of the wine. Is this pectin? How do I remove this film and getthe wine to clear? Glad it turned out well Jenn! Isn't the pear flavor shockingly intense? I'll try the lime in my next batch. For anyone who used this recipe and ended up with bad wine: Keep trying, make sure EVERYTHING is sterile, and you will eventually come out with some delicious dry wine. As Jenn pointed out you can make it sweeter after fermenting by using camden tablets to kill the yeast then some form of sweetener (cane sugar, corn sugar, honey, ect.). Camden tablets are available at your local homebrew store or online and are very inexpensive. I made a batch using pears from my pear tree and your recipe. I have never made wine but I am a huge beer brewer. I had more pears than your recipe called for so I adjusted proportionally. I did use raisins and added a lime (halved) which i read somewhere was a good addition. I allowed it to ferment about 4 months. Just opened it up for the first time and it is beautiful! Took a sterilized spoon and gave it a taste... scrumptious! YES, I WAS VERY SURPRISED! Very pear, dry and a little strong (alcoholic) but VERY drinkable and enjoyable. So I drove to the wine supply store, bought some bottles and a corker. He recommended camden tablets and wine conditioner to sweeten it and make sure all yeast activity is stopped. I sterilized everything and transferred it to another bucket with airlock. Was crystal clear until I pulled up spent yeast from the bottom so the finished wine should look pretty if I give it time to settle out. Planning on bottling tomorrow except a small pitcher which will go into the fridge for sipping immediately! Thanks for the recipe. Magi, if it is spoiled you'll be able to know. Brewing wine isn't what people traditionally consider "pretty", so don't let cloudiness and residues bother you. Open your wine and sniff. If it smells OK give it a taste. If it smells and tastes OK then it is OK. Homemade wine usually has some "off" flavors, but if it tastes bad don't drink it. If it tastes good then congratulations! gregory L. griffin, I'm glad it came out well. Drunken pears is new to me. Assuming you didn't boil out the alcohol I bet they would go great in some kind of frozen blended mixed drink, or maybe a drunken pear bread... If you don't mind, let me know what you do with them. I usually just toss my spent fruit into the compost heap. Chiggerhill- As I told Alva, I had a wine with a film like that once. I don't know what it is. It smelled and tasted fine, I just scooped the film off and wiped away the residue on the bottle with a napkin. I drank the wine pretty soon after that, so I don't know if it would have made it go bad with time. You will need some kind of tube or hose to siphon out the wine to taste. Pouring it will stir up the sediment and the white film (if you aren't able to clean it out). If it were mine I think I would go ahead and bottle or drink it if it tastes ok. If you have nothing else, just use clean plastic soda bottles. my wine has been threw ferminting for a couple weeks now and i took the airlock off and put the lid on the jug. 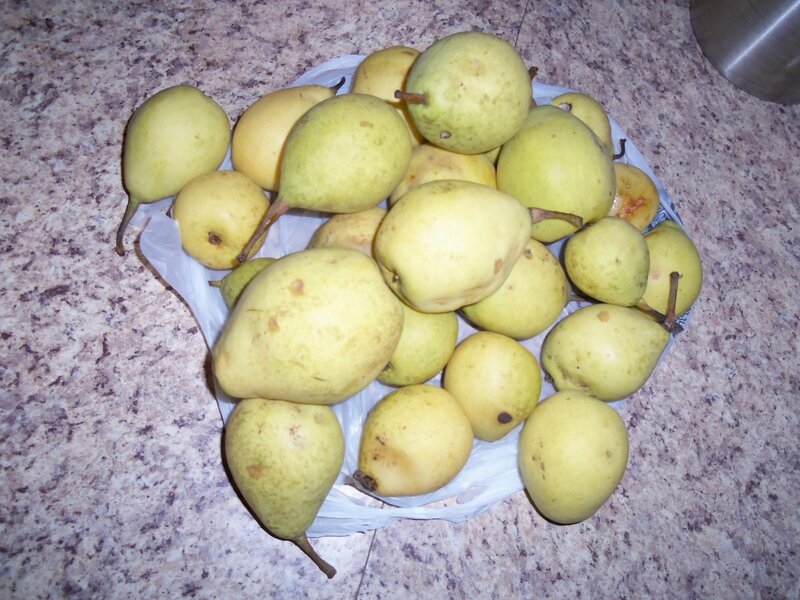 the pears had rison up to the top during fermintation and after started settling down some. however most are sorta floating, and the level of the wine has gone down and it looks like a white film like substance is on top. any thoughts on this? also should i try to taste it now or not. and im not sure how to get some of it out to taste? its been almost 8 weeks since i started it. I had an over abundance of praers this year so found your recipe and gave it a try. 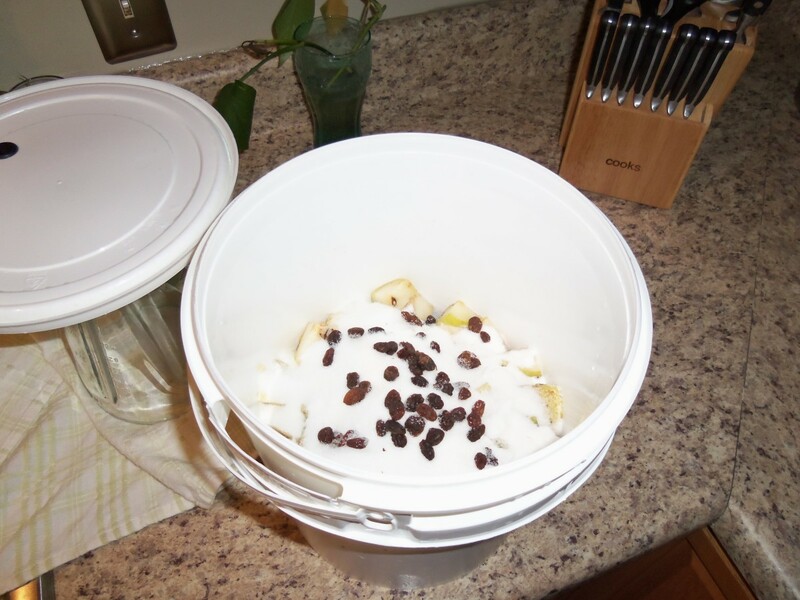 Used a 4 gallon ceramic crock, gallon of pears and adjusted the recipe to suit. You said 3-6 weeks so I tried it after 3 and it was alright, 4 weeks a bit nicer so let it sit for 8 weeks and then strained it through cheese cloth and put up in mason jars. Even ten it is not "crystal clear" but what the heck homemade. Had a quart on T-day and people enjoyed it much - even the ones who don't like dry wine. I used wax paper over the crock with pin holes and just put the crock lid on. Being curios I would peek in every couple of days. Will make again next year if I have another bumper crop of pears. 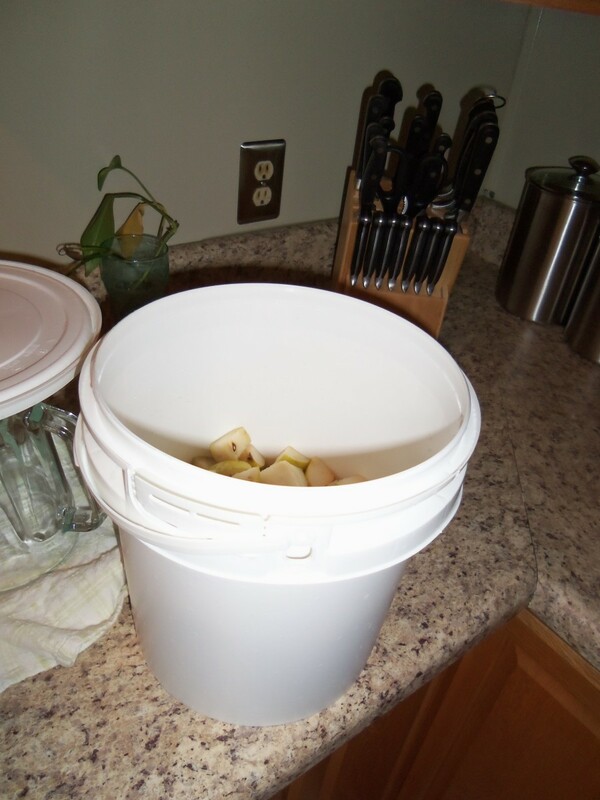 Oh, by the way I took the pears from the wine and canned (true canned) them up and now have a gallon of "druken pears" - just gotta figure out what to do with them, any suggestions? I made you pear wine recipe about 6 weeks ago, and am getting ready to rack it. My husband said he doesn't think the airlock was working well enough so he's not going to drink any. Will it be obvious if it has gotten contaminated and spoiled? Can it be dangerous or is it just gross? Sorry it took me so long to answer you guys. Jan, I literally meant boil and mash. Put the grapes in a pot, smash them up with your fists to break the husks, then add water and boil. If you use a traditional recipe I don't think you boil them, as that would kill the naturally occurring yeast, but I'm not familiar with that method so don't take my word for it. Chris, adding sugar after boiling can, and often does, contaminate your wine with "bad" organisms. If you mix your sugar with as little water as possible and boil it for a few minutes then cool it before adding you should be safe, though. Keep up with how much sugar you use so you can add it all at once next time. Alva, I had a wine with a film like that once. I don't know what it is. It smelled and tasted fine, I just scooped the film off and wiped away the residue on the bottle with a napkin. I drank the wine pretty soon after that, so I don't know if it would have made it go bad with time. If your wine smells and tastes good then I suggest that you drink it up while it's good as well. chiggerhill, I once had a wine brewing on top of the fridge that I forgot about for for six months! It ended up being one of the best wines I ever made, but luck probably had a lot to do with it. You can leave your wine in the primary fermenter as long as it takes you to get some more bottles, just be sure not to open it until then. Everyone please let me know how your wine turns out. how long can i leave the pears in the carboy that i am ferminting in. i made 3 gal and they have ferminted about 20 days and stopped bubling now. i dont have anything to put the wine into. any sugestions? I am making the pear wine and transferred it to a secondary ,but I noticed a thin film of white substance on the surface.Can u please tell me what it could be. Thanks for posting this! I had a bumper crop of pears this year and needed a way to use up a lot of it. I really liked the fact that it uses ingredients I usually have in the pantry, and it was easy to follow. Just put in the yeast so hopefully we'll have results in a few months! update: the hummingbird feeder with balloon airlock works great so far as i can tell! drilled hole in lid just a little bigger than the smallest part of the stopper, inserted stopper. then the straw into the stopper. i then attached the balloon with the hole poked in the end over the straw and secured with electrical tape. works great! i started a 12 gal. batch two weeks ago with the sand pears off my tree ,2o gal container and a balloon . so far i've started add more suger about 2 cups every few days .i ve tried a few samples and it is very flavorful but not quiet strong enough , im going to try to steatch out the fer. process a little longer .any pointers or ideas would be helpful ,and i need to filter it better the cloth and fitlers arnt doing a good job other wise turning out great thanks for the recipe! can you give me a list in detail on what you meant by the recipes for muscadines and scuppernogg . I did not understand what you meant by the boil and mash fruit. Jasmine, I'm glad that you find making your own wine as exciting as I do. Your homemade airlock sounds like it should work fine, just make sure to sterilize everything and make sure NO air can enter your fermenter. Try poking a couple of holes in the balloon with a sewing needle, which will allow gas to escape without air entering. Airlocks are the best way to go, though. There are a wide variety of stoppers available online, and a stopper and airlock will should cost less than $5 plus shipping. As for low budget ideas, my parent's never used any airlocks with their homemade wines, they just used glass gallon jars with wax paper and a loosely attached cap. Have fun with it, experiment, and let me know how things work out. Jan, muscadines and scuppernoggs are the best fruits for wine making next to grapes. Just boil and mash your fruit, add sugar, yeast, and water at the same ratio as this recipe and ferment! If you read up online you can find lots of better recipes for making wine with these fruits, many without yeast as the husks naturally contain the necessary organisms. hi rick! love your hubs! i started a batch of pear wine yesterday with moonglow pears. a 5 gallon paint bucket! so exciting! i cant wait to add the yeast today! i am going to airlock it with a "hummingbird feeder stopper and straw" with a balloon on the end of the straw....any ideas or comments on whether or not this will work? any better ideas for a low budget recycler? Hey Jan. Though it's not necessary to use an airlock at this point I would go ahead and put one on so that I have everything in place when it's time to add the yeast. I would like to know if you are suppose to put the airlock on right after you put the boiling hot water in the fruit and sugar. Sure, just make sure you chop the fruit small enough to get in and back out of the carboy. Make sure your mason jars are tightly closed and store them on their sides to prevent air from seeping in. And of course make sure everything is sterilized before use. Brandi, I'm glad you liked the recipe. If the wine is too dry for your taste you can always add a little sugar when you are sure the fermentation is completely finished, and since two months have passed it should be. We just bottled ours a couple weeks ago, and it turned out so good! We didn't use raisins and waited 8 weeks to rack ours. It is dry, but has a wonderful pear flavor. I shared your recipe with a friend today that has an abundance of pears. Thanks for the great recipe! 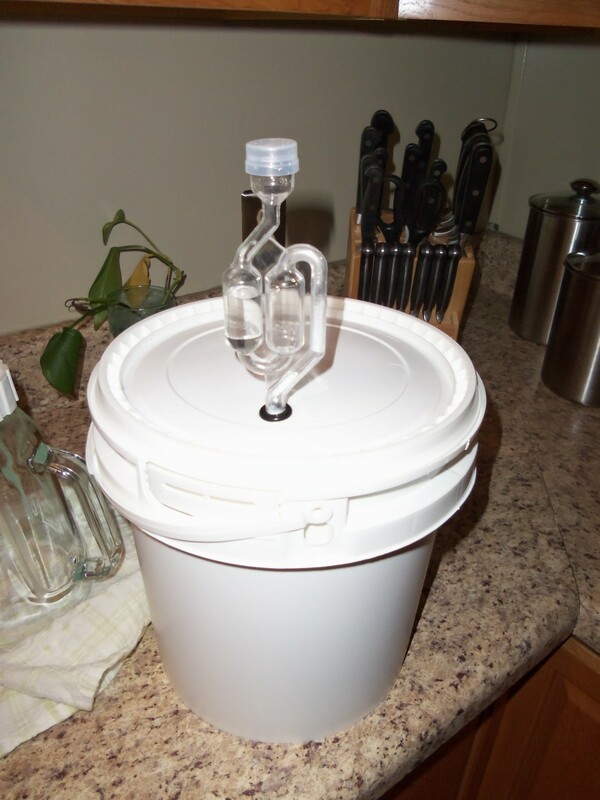 Can i use a carboy as the fermenting jug and then bottle the wine in seal-able mason jars?? Thanks to everyone for your comments. Glad you guys liked this hub, and please tell me about your results if you try it. Rachel, this batch turned out pretty good. It's dry, but not bone dry. Based on taste I would say that it contains 8-12% ABV, but taste isn't a really solid way to judge alcohol content. 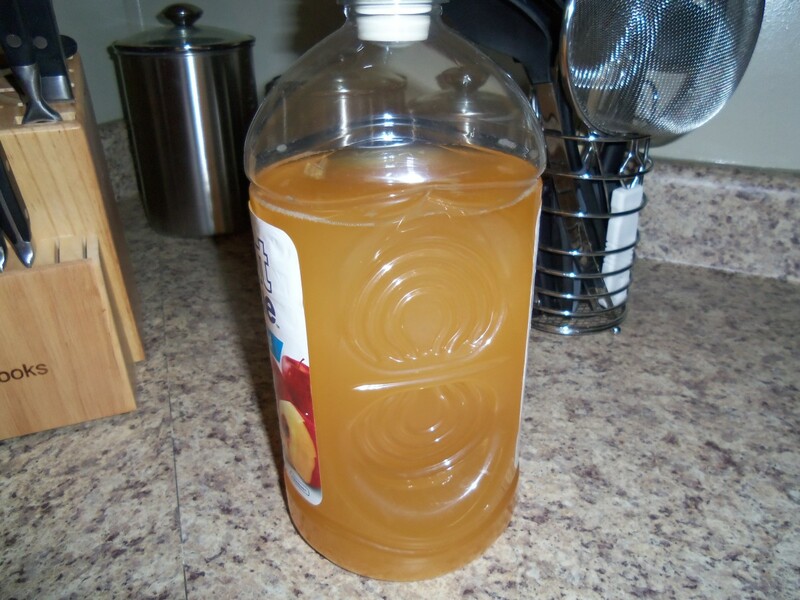 I was really expecting it to be a little stronger, considering that the two gallon container had 4 cups of sugar and was about half full of pears, but is seems that the fermentation stopped a little short of consuming all of the sugar. I'm OK with that, I don't like white wine that's too strong. The absolute best part about this wine was how strongly it tasted of pears. With many of my other homemade wines a lot of the flavor of the fruit was lost or altered during fermentation, but not in this one. I recommended 3-6 weeks before racking in my recipe, but I left this batch in it's primary container for about three months, and I'm thinking that extra time helped the wine absorb more pear flavor. wow this is great !!! i love pear wine..
Pear wine is new to my ears.Great hub.Thanks for sharing. This is great! I have two pear trees in my backyard and have been looking for recipes to use them for. Thanks!!! Very nice hub. I can't wait to try this. A very useful hub. Now we can have homemade wines fresh from scratch. Thank you.